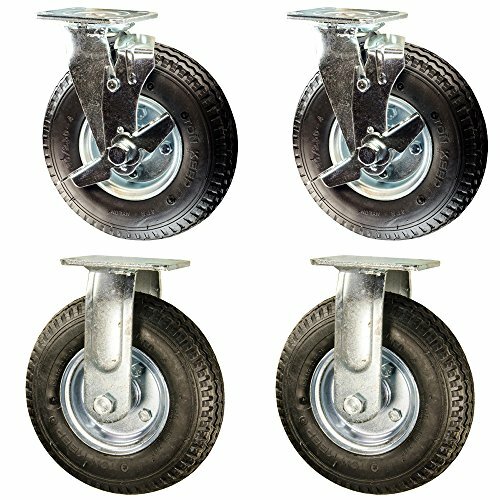 Listing is for a set of four (4) Service Caster Series #100 casters, two (2) rigid and two (2) swivel casters with top locking brakes, fitted with 8" diameter by 2" wide black pneumatic rubber wheels. Supports a total weight of 1,200lbs (300lbs/caster). When searching for a reliable and durable solution to your caster needs, look no further than the Service Caster Series #100 casters. The universal design provides an excellent OEM and replacement part for luggage carts, food carts, or any application your business requires. With it's zinc plated finish and pneumatic rubber wheels all rolling on finely crafted ball bearings, the Service Caster Series #100 provides enhanced noise reduction and consistent roll on any surface, for an overall superior ride under any condition. Note: this caster is NOT intended for highway use! Manual speed only. Service Caster is unsurpassed in quality, reliability, and excellent customer service. Count on us to move you forward. Top Plate Size: 4" x 4.5"
Bolt Hole Pattern: 2.625" x 3.625" to 3" x 3"
If you have any questions about this product by Service Caster, contact us by completing and submitting the form below. If you are looking for a specif part number, please include it with your message. Bariatric office chair with four locking casters (5” dia. ), 24" wide, rated for 600 lbs.